Considered the most remote point in the entire world. 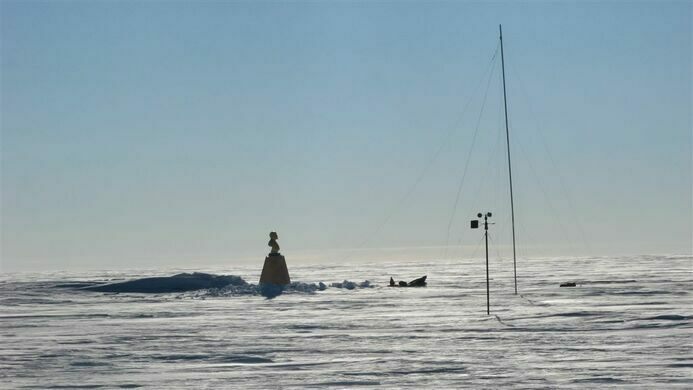 If there is any place in the world capable of making the South Pole look like a balmy hive of activity, the Southern Pole of Inaccessibility is it. Located at the furthest point from the Southern Ocean, the Pole has a year round average temperature of -58.2°C (-72°F). Due to its remoteness - the South Pole is 878 km away and the nearest city, Cape Town in South Africa, is 5631 km distant - the Pole doesn’t see visitors very often. A Soviet expedition led by Yevgeny Tolstikov reached the Pole of Inaccessibility for the first time in 1958. The group left a small research base, also called Pole of Inaccessibility, topped off with a bust of Vladimir Lenin that faces Moscow. The station was in operation from December 14th to 26th, 1958. Since then, at least two more expeditions have reached the Pole. An American expedition arrived in 1965 and in 2007 a British/Canadian expedition became the first to arrive on foot, where they discovered the research station completely covered in snow. Therefore, they were unable to get inside the building to sign the golden visitors’ book that the Soviets had left nearly fifty years before. Antarctica, 878 km from the South Pole. Naked scientists race around the pole in the frigid cold to try to join Antarctica's exclusive 300 Club. A gravity-defying "devil's bridge" that has a surprising architectural feature for its stability.